The TOMAL-2 assesses memory functioning in children, adolescents and adults. 5 to 59 years 11 months. The TOMAL-2 is a memory battery used for evaluating general and specific memory function for children, adolescents, and adults ages 5 to 59 years 11 months. The standard battery for the TOMAL-2 consists of eight core sub-tests six supplementary sub-tests, and two delayed recall tasks. TOMAL-2 sub-tests include Memory for Stories, Facial Memory, Word Selective Reminding, Visual Selective Reminding, Object Recall, Abstract Visual Memory, Digits Forward, Visual Sequential Memory, Paired Recall, Memory for Location, Manual Imitation, Letters Forward, Digits Backward, and Letters Backward, plus 2 verbal delayed recall tasks and cued recall procedures. TOMAL-2 core indexes consist of the Verbal Memory Index, Nonverbal Memory Index, and Composite Memory Index. 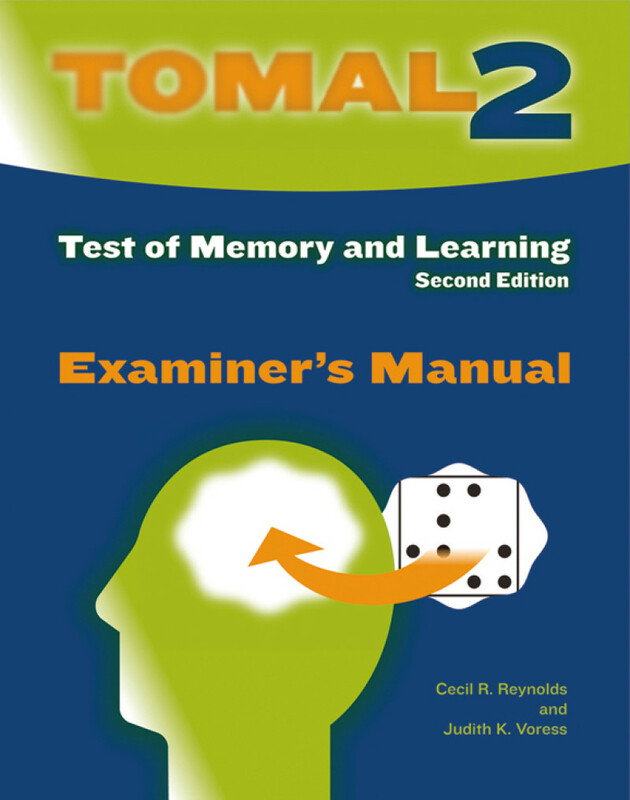 TOMAL-2 supplementary indexes are composed of the Verbal Delayed Recall Index, Learning Index, Attention and Concentration Index, Sequential Memory Index, Free Recall Index and the Associative Recall Index. Additional analyses to ensure a culturally fair assessment of memory. Expanded norms for children, adolescents and adults, ages 5 years through 59 years 11 months. Reformulated core sub-tests and core indexes. Redesigned, convenient to use Record Booklet. New Verbal Delayed Recall Index. Additional interpretive tables and text. More than 1900 US children, adolescents and adults ages 5 to 59 years 11 months, representative of the US population in terms of age, gender, ethnicity, urban/rural residence and geographic distribution. Core battery: 30 minutes; Core supplementary: 60 minutes.